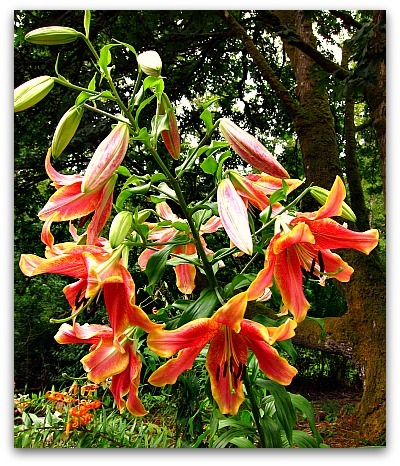 Regale Lily, one of my favorite flowers, beautiful, fragrant and easy to grow. As a guest speaker at the Vashon Island Garden Tour, I’m about to grab my gardening soapbox and expound on the wonders of my favorite flowers: Roses, Peonies, Lilies and Dahlias. I call them the Grand Dames of the Garden, but that may be too stuffy a reference. 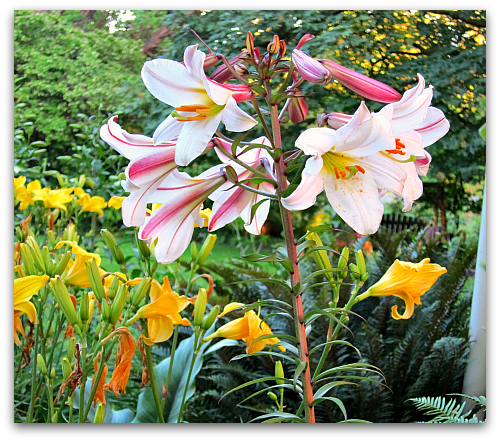 Each of these flowers brings an excitement and unbridled enthusiasm to the garden, as well as a cooperative bloom sequence, one right after the other with little overlap. Their floriferous fireworks are always lighting up the landscape, beginning with peonies, moving into roses, rounding out mid to late summer with lilies and mid-summer to the first frost with dahlias. Below I’ve listed some helpful links for growing these dreamy bloomers, so you too can have an audience with garden royalty. 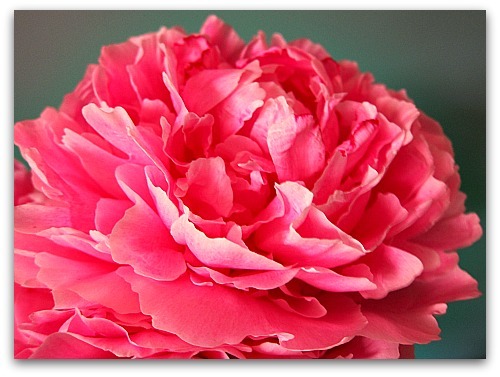 Peony “Mrs. FDR” is the brightest smile in my spring garden. Who can say no to a bucket full of dahlias? 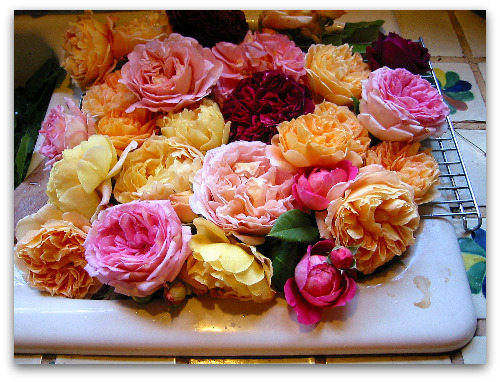 Some of my David Austin roses taking a dip and a drink in the kitchen sink. Check out these links and then get out into the garden! And if you have any questions, leave a comment and I’ll try to answer it in a timely (and hopefully accurate) way. Beautiful blooms! Hoping to make it in time for your garden talk tomorrow! I’ve always been incredibly jealous of folks that can grow roses. Yours are, by far, the most beautiful of all. I’d hate you…..if you weren’t so darn “nice” about it all. If it’s any consolation, any time I head down to Napa or Sonoma County, CA, I look at the local roses and feel the same way; they’re bigger, better, without blackspot, profuse in bloom. Thank goodness, the area’s libations can calm my angst. How I wish I could attend the garden tour! I’m with Eileen and ditto Sue too. You’ve such amazing talent Tom. Just sayin’! Perhaps you can help me with a quest I’ve been on since I was a girl, Tom. When I was young, we lived in Texas where there is a bright yellow (yep, that one) single rose that smells of both cinnamon and a very heady rose scent. I don’t think the Texas wild rose survives in my area (south-central Pennsylvania), but there surely must be a rose somewhere that is similar. Might you know of such a one? I’ve enjoyed this post and your lovely photos. Wow, on that peony and David Austin roses are always the very best! Plus lilies and dahlias to boot. Gorgeous all … thanks for sharing, Tom. You are feeding my soul–thank you! Tom! Tom! If I had only known! I would have taken the Pt. Defiance ferry and zoomed over to see you! I saw tickets for sale for the tour! I didn’t know you were part of it! Phooey. Dear, sweet Tom. I am definitely NOT a robot! Last time I checked 2 + 2 = 4. Maths are fantastic – the answer it always the same! Never mind…I found it! Google did it again. Awesome post with some great links… Garden Royalty indeed! Thank goodness there are people like you to make the world beautiful. My brown thumbs just don’t cut it. Everything looks gorgeous – wish I lived close enough to see your garden in person. Enjoy the summer show! I hope you had a great time and met lots of awesome gardeners. Dahlias are my favorite, but I thoroughly approve of all three choices. Stunning flowers & such variety! I also have 3 peonies but in white! 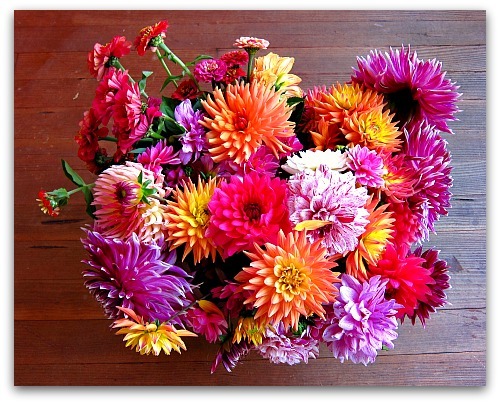 Your pink one is so beautiful & who doesn’t love dahlia’s!!! Such beauty!